Thirty-six years ago, a mere lad of 25, I was already a veteran classical music and jazz fanatic. I bought LPs, attended classical concerts with the Miami Philharmonic, recitals by some pretty great pianists, operas, and heard great jazz at the many venues we had in South Florida back then. I never learned to read music, nor did I play an instrument, but my love of music was—and is—unbreakable. I flew in to New York City alone as was my custom for most concerts and recitals; I hadn’t met any attractive ladies in my age group willing to indulge a classical music fanatic and audio freak like me. I spent most of my first day full there, Friday, visiting the sites. I went to the late, lamented World Trade Center towers, ate at the Carnegie Deli, walked around and gawked at more buildings, and, of course, ate hot dogs. I visited some great record stores in Midtown and Downtown and bought a bunch of LPs that I still have in my collection. I was eager with anticipation for the night’s concert. The Brahms Third and First were given excellent performances. Interpretively, Karajan’s standard-setting 1964 recorded cycle is still my favorite, but I was enthusiastic, as I knew this was a once in a lifetime event. The Third, my second favorite of Brahms symphonies, was brilliantly performed. (I love that final movement!) The First was given a fine performance as well. (The New York Times reviewed the two concerts.) After hearing this magnificent orchestra playing Brahms in the pre-renovation Carnegie Hall that first night, I can say that the hall deserved every bit of its reputation as one of the most acoustically perfect halls in the world. I heard every note and phrase clearly in that space, regardless of fortissimo or pianissimo. A marvel, absolutely superb. Gusman Hall in Downtown Miami, my sum total of concert hall experience until then, was but a shadow of what Carnegie was, despite its problems. After another day of sightseeing and more LP buying on Saturday, I gave myself an additional treat that last evening. Before the concert I had dinner at the original Russian Tea Room, next door to Carnegie Hall. I drank cold vodka, had a superb lamb dish, and drank tea served in a traditional Russian tea glass. After I finished my dinner I walked next door to Carnegie about an hour early for the concert and started chatting with other fans that were already there. We talked about Mahler, Bruckner, Beethoven, Brahms, Karajan, Furtwängler, the Berlin and Vienna Philharmonics, Leonard Bernstein (of course), our favorite recordings, and so on. It was wonderful to share my love of classical music and opera with folks (other than family and a couple of acquaintances) and not experience the deadened eye rolls of those whose favorite music comes in loud, monotonous, three-minute rhythmic chunks. 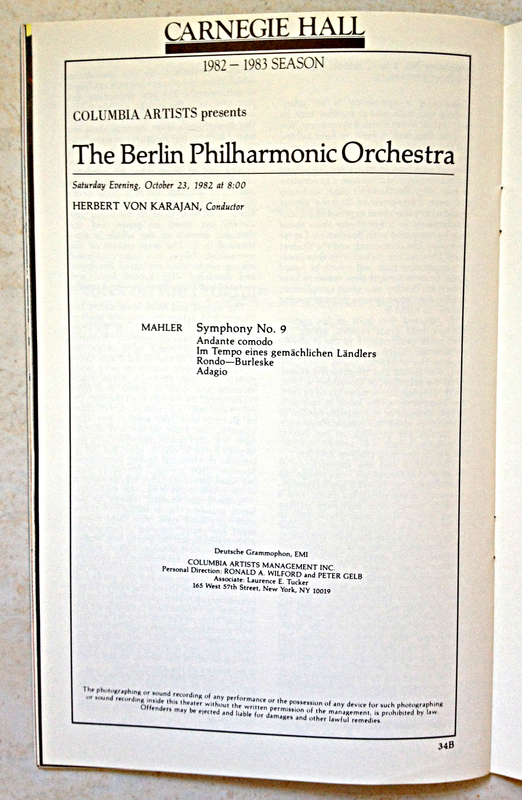 The only work on the Saturday program was Gustav Mahler’s Ninth Symphony, an hour-long symphony that was fated to be Mahler’s final completed symphony. I had not listened to all of his symphonies back then. I knew the First and the Second, the Fourth, Fifth and Sixth, Das Lied von der Erde, and, of course, the Ninth. 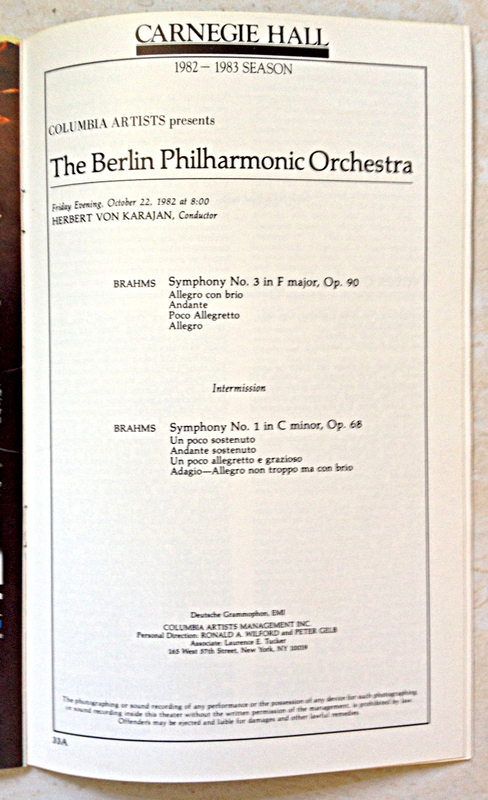 I had heard two versions of the Ninth before the concert: Karajan’s Deutsche Grammophon studio recording from 1980, and one of my treasured recordings, Bruno Walter’s EMI recording with the Vienna Philharmonic from 1938—the famous Anschluss Ninth, performed and recorded live just two months before the Nazis took control of Austria forcing Walter to flee. As much as I liked the recordings I had listened to, nothing, absolutely nothing, could have prepared me for the experience of hearing this work performed live by Karajan and the Berlin Philharmonic. The frail Karajan, seventy-four years old and ailing from back surgeries, walked out slowly to thunderous acclaim for him and his orchestra on their last night in New York. After the applause it was deathly quiet; everybody in the hall was on pins and needles waiting for the two “heartbeats” to begin the first movement. Once they did, the symphony unfolded itself in such a way that it was impossible not to give rapt attention to everything going on in the score. The first movement Andante was played brilliantly, full of longing and pain; the Ländlers and Rondo-Burleske were amazing as well. But it was the final movement, that glorious Adagio, the most difficult of symphonic movements for a conductor and orchestra to sustain through its final pppp moments, that hit me like a thunderbolt. Mahler had glimpsed what the other side was and had written it down for all of us to hear. Those last twenty-five minutes unfolded as if from the heavens above until the strings of the magnificent Berlin orchestra faded out and Karajan put his baton down. I was, quite literally, in stunned silence at the end. So were many others. The ovations were many and long. This was the greatest concert I have ever attended, bar none, and the passage of time has not diminished my vivid memories of it. Its effect on me has been mystical, spiritual, other-wordly. I don’t know quite how to explain it other than the music moved me and reached inside my soul and shook it up forever. A live performance by Karajan and the BPO at the Berlin Festival, recorded that year and released on Deutsche Grammophon a few years later, was the very first compact disc I ever purchased—and I hated compact discs with a passion. Not a month goes by since I purchased it that I don’t listen to it and remember that night. I have fourteen versions of this symphony in my collection (including the two by Karajan): two by Bruno Walter, three by Leonard Bernstein, Sir John Barbirolli, Giuseppe Sinopoli, Valery Gergiev, Carlo Maria Giulini, Jascha Horenstein, Bernard Haitink, and Riccardo Chailly. Some are excellent, and some are okay—I especially like the Concertgebouw and Berlin Bernsteins, the Horenstein, and the Berlin Barbirolli—but only the live Karajan comes close to what I heard that Saturday night. This symphony has at times been apocryphally described as Mahler’s premonition of his doom (he died in 1911 at age 51); maybe it was Karajan’s premonition as well. After the series of concerts in which he conducted the Mahler Ninth, an interviewer asked Karajan why he never conducted it again. He replied that the music had shattered him in such a manner that he could not open the score again. He is quoted by his biographer Richard Osborne as saying that the music in the symphony is “coming from another world, it is coming from eternity.” I know what he meant and his interpretation bears it out. It is devastatingly beautiful music, full of sadness, longing, and resignation—and, yes, a little anger. Today, at almost 61 years of age, I believe I’m beginning to understand what Mahler was trying to tell us about love, about life and beauty, about spirit and transcendence, about impermanence, about farewells, and about death. If you want to hear what it was like to be at Carnegie Hall that chilly October night, listen to the live Karajan recording of the symphony—but especially the Adagio—in a darkened room, as quiet around you as you can get it. This is as close as you’ll come to matching what I experienced thirty-six years ago tonight. In a a previous post, I mused about the new age of digital sound reproduction and how amazingly good — no, scratch that: great — DSD and Blu-ray Audio sounds. In this listener’s opinion, digital sound has finally come of age and gone to places none of us could have imagined back in the early 80s when Compact Discs were first introduced with the then empty promise of “perfect sound forever.” I also lamented on how LPs were no longer going to be a part of my listening. I haven’t changed my mind on the former; about the latter, read on. Since that post was published in February 2014, I’ve made several changes to my system that have improved the sound. I’ve switched all my interconnects and speaker cables to Transparent Cable. I no longer have the slight edginess I had before with the Nordost Blue Heavens. I’m not knocking them at all; they were an improvement in my system when I added them. What I’m saying is that my particular mix of equipment sounds better with Transparent, real. They are a definite improvement in the bass, which is as solid as a rock now. I don’t use the McIntosh MC30 tube amps every day for obvious reasons — after all, these are 62 year old amplifiers who have been refurbed once already. But when I do use them they’re heavenly. Best amplifiers I’ve ever heard in my system. My Bryston 3B-ST — what I called my “everyday” amp — was nearing the twenty-year old mark when it would no longer be under warranty. I had purchased it used with seven years left on the (amazing) Bryston warranty. I sold it and bought a used Harmon/Kardon Citation 12 amp. A musical amp, very satisfying to my ears. Alas, it lasted all of six months before it failed. I replaced it with a brand new Parasound 275v2. Nice, overall, but not as musical as the HK. The Parasound is my “everyday” amp now. It’s not the best, it’s a little bright, but it’ll do. I also sold my old Classé preamp and replaced it with a near mint condition McCormack Micro Line Drive preamp (also bought used) that can be used either in passive or active mode. This is as “straight wire with gain” as I can currently get. The biggest equipment purchase I’ve made since 2014 was also the most ear-opening. It has irrevocably altered my view on how the ‘Redbook’ CD — and its PCM derivations — sound. I enjoy listening to CDs ‘straight-up’ through my Oppo BDP-105 with its excellent DAC. Listening to the same CDs through the PS Audio DirectStream digital-to-analog converter, however, has shifted the paradigm. The DS DAC takes the PCM (Pulse Code Modulation) encoded into every CD and converts it to DSD (Direct Stream Digital) before outputting it to the preamp. The results of this magic are nothing short of amazing. I can’t tell you the number of times I’ve sat there listening to music and marveling at how good PCM really is. The difference between the Oppo’s internal DAC and the DirectStream is not subtle. And the Oppo is no slouch. Later this year, PS Audio plans to release the DirectStream Memory Player, a new transport, based on the Oppo transport mechanism, that will play CDs, SACDs, and Blu-ray Audio discs, among others. This transport is unique in that the DSD layer in SACDs will now be sent as a bitstream via I2S to the DirectStream DAC for playback. All disc output, not just SACDs, will be now be heard in glorious DSD. I plan to move heaven and earth to get one of these babies. The sound wasn’t what I had expected out of a Linn. The sound pulled out of my LPs was less than stellar. I did some minor tweaks, including repairs to the Linn’s unique suspension, by a local Linn dealer. But the results were still not as good as I had hoped for. I knew the only way to improve this table, and that was to throw a lot of money at it. I definitely needed to upgrade the tonearm, the interconnects, possibly revisit the Linn’s suspension mechanism again, and maybe upgrade my phono preamp. Expensive tweaks that would result in a large upgrade bill: at least $2,000 and probably more. And, to add insult to injury, I would still only have one speed and wouldn’t be able to play high-resolution 45rpm LPs. The law of diminishing returns kicked in with my dissatisfaction and I threw in the towel: in May 2014 I sold it. Separately, of course, to make up as much as I could of my total investment: turntable, tonearm, interconnects, cartridge. Quo vadis, analog? Out the door, sadly. I went all-in with digital, using the Oppo as the main source for all my listening and, starting in 2015, with the DirectStream DAC as my digital processor. I’ve been extremely happy with the sound of my system. Then a funny thing happened. Earlier this summer I purchased a “millennial” high-end audio rig for my then almost 21-year old son: a Pro-Ject Essential II turntable, and a PS Audio Sprout integrated amplifier, driving my almost twenty year old B&W DM302 loudspeakers — plus his iPhone, of course. After setting up the Pro-Ject, I taught him the basics of using a turntable and how to use LPs. We spun his first LP on his first real sound system: Combat Rock by The Clash. (Number two was Frampton Comes Alive.) Not only was I thoroughly impressed with the sound coming out of the Sprout for Bluetooth and digital, but the Pro-Ject sounded quite fine. The phono section of the Sprout was damn good and I thought that, maybe, an integrated solution was the best choice for me to reenter the world of vinyl. After all, I still have over a thousand LPs in storage that I haven’t sold. I decided on the VPI Player, the second generation of VPI’s Nomad turntable. The Nomad was very well reviewed and the rumors in the spring was that the second generation version of that turntable was forthcoming in the summer. I decided to wait. It finally arrived October 1. It was the easiest turntable setup I’ve ever had. Literally, it was unpack it, plug it in, plop an LP on it, drop the tonearm and play! I’ve had it for only two days but can confidently report that it is a winner. I finally have an analog rig that gets the juice out of my records, much better than my Linn ever did and, as a bonus, it cost a hell of a lot less than the Linn upgrades I was contemplating. First LP played? A 45rpm direct-to-disc Charlie Byrd jazz album that is one of my reference discs. I hadn’t heard in a very long time and can honestly say that I’d never heard it the way I heard it Saturday. Wonderful. A full review will follow soon.